One of the latest inventions by the Islamic State in Mosul is the mobile pulpit. Most recently a caravan for propaganda appeared in a city fun fair. The target for extremist recruitment? The city’s children. It has almost become a joke among the families of Mosul. It goes like this: If your child disappears, where should you look for him? The nearest extremist training camp, of course. Mosul is currently controlled by the extremist organisation known as the Islamic State, who took over the city violently last June, and the group has set up several training camps around the city. Disturbingly, a lot of the new trainees seem to be under 18. The Islamic State, or IS, group has always been keen about getting their teenage fan club going. When they first took over Mosul in mid-2014, they selected a number of enthusiastic teenagers from in the city and sent them to their Syrian “capital”, Raqqa, for weapons training. This was just the beginning. Since then they have set up a number of training camps in Mosul says Younis al-Zubaidi*, a retired army officer who knows individuals with close ties to the IS group. Al-Zubaidi says that today the camp known as the Abu Musab al-Zarqawi camp in the forests outside of Mosul is well known and there are also others in places around the city including in Qayara, Biaj, Hada and Hamam al-Alil . From the beginning of their rule in Mosul the IS group has been enthusiastic about getting fighters in contact with the city’s young people, having them visit schools and give lectures. These men rely on preaching and on awakening religious fervour in local youth and the extremist group clearly has plans for its legacy members. A Mosul school teacher, Mahmoud Ali, says that the IS fighters are continually coming up with excuses that allow them to visit local secondary schools where they distribute leaflets and CDs to the pupils; the CDs contain footage of military operations and religious songs to inspire what they call “holy war”. Many of the recent attacks by suicide bombers have actually involved younger members of the IS group – and this is one of the biggest sources of concern for Mosul families. The fighters don’t just target local teens, they’re also trying to influence children under 12. 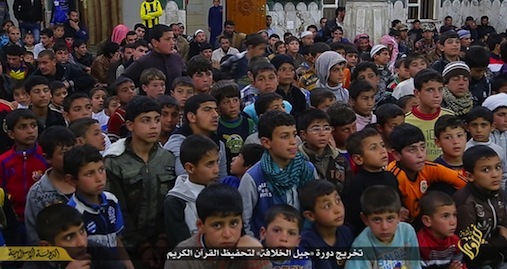 They describe these younger children as the “Generation of the Caliphate”, referring to the fact that they believe these children will grow up inside their self proclaimed religious state. The younger children are often recruited during sessions held in local mosques when the kids are meant to memorize verses from the Koran. Ali believes that during these sessions, the IS members in charge try to introduce new, extremist ideas to the children about topics like infidels, holy war or jihad, and murder. “Children are also taught religious songs about jihad,” the teacher notes. A few days ago the IS group released a short film documenting some of these ideas. The video, which has also been shared on Twitter and Facebook, shows what may best be described as a mobile pulpit inside a Mosul amusement park. Heavily armed children wear military uniforms and fervently advocate jihad. “Listen to me. I am giving you good advice, you must fight for God’s sake and you must pledge allegiance to the Caliphate,” yells one child, who doesn’t even seem to be 12 yet, through a loud speaker. This boyish orator was followed by another who was clearly trying to emulate the IS group’s leader, Abu Bakr al-Baghdadi – he was wearing a watch on his right wrist like the group’s leader, apparently severely injured recently.This boy sang songs about holy war, bombs, murder and executions. Both of the boys were surrounded by other young men and boys, many of whom appeared to stare at him in admiration. And of course there are other reasons too. Haj Ahmad, a 16-year-old in Mosul, ran away from home after a fight from his father. After searching for him for two days, the family discovered that the teenager had gone to the Abu Musab al-Zarqawi camp on the outskirts of the city. The family managed to bring their son back home where they are trying to convince him not to return to the camp. It seems he won’t though because apparently he says the training is very tough and wasn’t what the boy expected. And because one of their neighbours is a senior member of the IS group the family were also able to get Ahmad’s name removed from the camps records of enrolment. *All names in this story are pseudonyms. None of the individuals could be identified because they remain in Mosul and could be targeted by extremists for speaking to the media.